Our communities feature spacious lots with great views on gently rolling, semi-wooded terrain, partially bordered by wetland nature preserves and spectacular lakefront properties. With years of experience subdividing a number of area properties, Kathcon carefully evaluates an opportunity to determine it’s highest and best use. An environmental approach that safeguards water and natural features is preferred wherever possible, to add value to a residential or commercial parcel. An “in-fill” subdivision built on six acres on the Mt. Prospect/Arlington Heights border. Kathcon Estates offered a full dozen one third to three quarter acre home sites that were ultimately graced with twelve upscale custom homes built by Kathcon Development. Completed in 1992, this subdivision has certainly withstood the test of time and is still known as a jewel of a neighborhood in the area. Noteworthy of this subdivision was the engineering required to make Kathcon Estates a reality. The Village sanitary sewer system was located across a creek from the site. Kathcon and our engineers designed a plan to auger under the creek yet above the Deep Tunnel Project located beneath the creek bed. The augured pipe was nearly three stories under-ground, over two hundred feet long and beneath the creek but above the Deep Tunnel. There are great lengths Kathcon will go to finish a project! A thirty six unit subdivision in the far northern community of Antioch boasting spectacular views of Redwing marsh from one to two acre home sites. The rolling topography and varying landscape gave rise to Kathcon’s concept of “Custom sites for custom homes”. Each site has its own unique qualities: walk out basements, English basements, pond lots, marsh view lots, reverse sloping, and heavily wooded sites. Kathcon worked the land to blend the subdivision with the environment to create the unique lots rather than bulldozing everything in sight to create equally bland, square home sites that are easy to develop and more profitable to build on. Cited by the then Illinois Department of Conservation as a model for developers to emulate when working with environmentally sensitive areas, Hidden Creek is home to many beautiful custom homes befitting the home sites they grace. Hidden Creek has become the subdivision to aspire to in Lake County, Illinois not just because of the beauty of the site but that it is in perfect harmony with the stunning custom homes and families that grow there. At Kathcon, we always accentuate the hidden qualities of our projects. 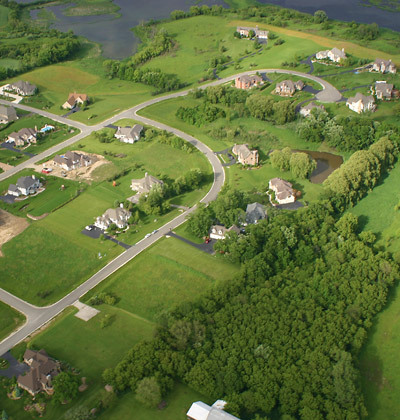 Once again, cited for excellence in developing environmentally challenging sites, Kathcon developed thirty nine half acre to acre home sites in Grayslake, Illinois. Battling isolated wetlands, poor access roads and a mile long path to install city water to the subdivision, Kathcon found a way to overcome all the challenges and produce a first class subdivision featuring beautiful lake front lots, pond front lots, and English/walk out basement home sites. At Stony Ridge, Kathcon followed the tradition established in Hidden Creek to develop its subdivisions in concert with the natural environment found there when we originally inspected the site. It can be said that Kathcon Development will leave no stone unturned to create a truly well designed and appointed subdivision.